What Do Customers Say About Us? WHAT SOFTWARE SHOULD YOU USE TO CREATE YOUR ARTWORK? When will I get my printing? How do I send you my artwork? VAT, do I pay it? This page is for leaflets printed using high quality digital presses. Please call the helpdesk if what you want is not on this page. For DVD and CD inserts, select the relevant Flat size. You can find CD & DVD booklets from the main menu. To get an instant quote, configure your product and click "calculate price". There are errors in your form, see details above! There is a no minimum order quantity, choose exactly the amount you want. These are the different standard sizes that you can choose from. Please call the helpdesk if you'd like a quote for a different size. For CD and DVD products, please note that if you want any creases or folds, you must specify this. Please select this option if you would like your leaflet folded. Once selected, you can choose the type of folding that you require. Please note that, depending on the weight of your leaflet, we may automatically pre-crease the folds. The creasing option is for where you want the leaflet creased and left flat. Please note that we don't offer folding on the very small sizes, i.e. A6. 1 fold, folded in half (4 sides), sometimes known as a 4 page brochure or booklet. 2 folds, letter fold (6 sides). This is called a letter fold as it's the way most A4 letters are folded up, i.e in thirds with the bottom third tucked inside the top two thirds. 2 folds, Z fold (6 sides). Similar to a letter fold, except that the bottom third is folded the other way around. Viewed from the side, the folded leaflet makes a Z shape. 2 folds, gate fold (6 sides). All the previous options result in roughly equal panes (some are slightly shorter so that they fold neatly). This option has a larger central pane, with two smaller panes to either side. These side panes open like a gate, hence the name. You are welcome to ask for samples if you are unclear about the different fold types. These are crisp matrix creases and allow you to neatly fold your leaflet along the crease. If you want your leaflet supplied FOLDED, please select that option instead. With folding (depending on the weight of your leaflet) we may automatically pre-crease the folds to prevent the print from cracking. The creasing option is for where you want the leaflet creased and left flat. Select which combination of printing you require. Your leaflets will be printed on a high quality production press. Please contact the helpdesk if you would like some samples. There are a lot of options so that you can have exactly what you want! Silk paper. Triple coated silk paper. This is a silk paper similar to the ones that you see in magazines and illustrated "coffee" table books. It is quite matt with a slight sheen. Gloss paper. Triple coated gloss paper. This is a gloss paper similar to the ones that you see in magazines and illustrated "coffee table" books. This is a commercial printing paper, it is not the same as the high gloss paper you may use for photographs in your inkjet printer, the gloss level is lower than gloss photo paper. White matt. A smooth white sheet with good opacity. White matt recycled. A smooth white recycled sheet with good opacity. Off white recycled. A recycled sheet with good opacity made from 100% Post Consumer Waste. This is genuine Cyclus Offset paper from Arjowiggins Graphic. Described by the manufacturer as "natural white", the colour is an off white and is designed to incorporate minute flecks and imperfections. It has a "softer" and more organic feel to it compared to the other options. This is a much loved paper, but we recommend you take your time and get samples when specifying this stock. Although we get excellent results with both black & white and colour printing, you need to understand what the off white colour will do to the reproduction of your images. We have many customers who have printed and reprinted full colour graphic novels on this paper, so excellent results are achievable. You can choose from either a gloss, matt or soft touch protective laminate. The gloss laminate is high gloss. Soft touch laminate is a matt laminate, but with a tactile soft finish. This is a very fashionable and doesn't mark as easily as matt laminate. We don't recommend single sided lamination on sheet weights less than 250gsm or double sided on less than 200gsm. PDF (online soft proof). This is a technical process to check that your artwork is printable and to prepare it for printing as far as possible. We aim to provide your soft proof within 4 working hours and you will get an email notification when it is ready. You will always get an online soft proof, even when you have ordered a hard copy proof. Hard copy proof. We will print a colour accurate copy of your leaflet on the paper that you specify. This will not include any finishing, including laminating, creasing and folding. Your hard copy proof will be printed as soon as possible and sent via first class post. People generally get their hard copy proof within 1-3 days. Please do not approve your online proof until you've checked your hard copy! If you do not have a credit account with us, orders that include hard copy proofs must be paid for before we can generate the hard copy proof. The PDF that you send us (your artwork) has a pre-flight check carried out and a number of automatic corrections may also be made if necessary. The resulting soft proof is a PDF that is viewable through your admin area of the web site. It is very important that you carefully review your soft proof and the pre-flight report that we send to you. If your artwork fails our preflight checks you will not get a proof, but you will get a report letting you know what is wrong with your file. You can then fix the problem and resubmit your artwork. We may warn you about potential problems with your artwork. In this case, your artwork CAN be printed and you will get a proof to check. You should carefully check the warnings in your report before deciding whether to proceed or submit new artwork. Your first soft proof is included in the price of your order. If you find that you need to make alterations to your artwork and ask us to create another proof, we may make a small charge for each additional soft proof. Please contact the helpdesk to arrange payment if you need additional proofs. Remember, this is a technical file check, we don't proof read or check your design! These are working days to print. Our standard print service for leaflets is 3 working days to print. Please remember to add transit (delivery) time to this and remember that these are working days to print and do not include weekends or bank holidays. Unless you approve your order by 10am, the day that you approve your proof does not count in the time to print. Delivery is normally the next working day AFTER the job is printed. If you want a Saturday delivery, call the helpdesk to get that cost added to your order. We classify Monday-Friday as working days, Bank Holidays are not working days. Fill in the full postcode of where this is being sent to so that we can work out a price and whether we deliver to this area. You'll fill in the full delivery address later once you've placed your order. UK postcodes only please. We can deliver to all other EU destinations, but you will need to speak to the Helpdesk to get a price for this. We do not deliver to the USA. You must upload your artwork as one PDF. You must read the artwork preparation guide before sending us your artwork. If you need help with your artwork, we have experienced artworkers and very reasonable rates. Please call the helpdesk on 01452 751900 for a chat to discuss this. Please read our artwork preparation guide BEFORE submitting your artwork. It may well save you time and money! 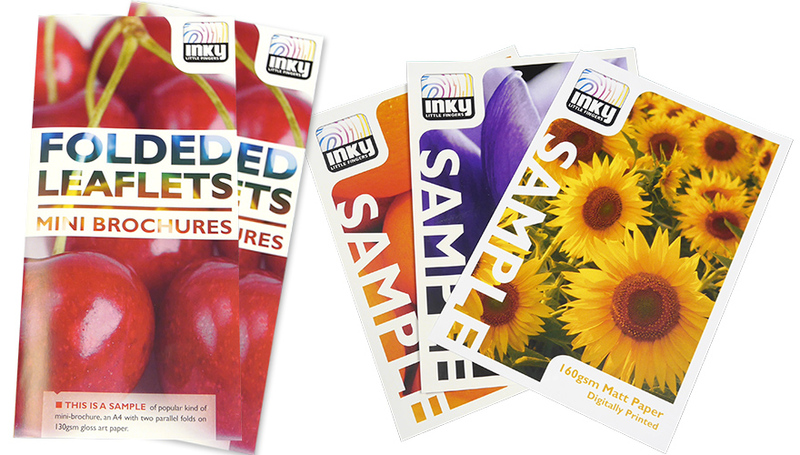 If you're new to Inky, please have a read of our handy dandy How To Place An Order guide. It tells you all you need to get started. Call or email us if you need any help. Please contact the helpdesk if you'd like any samples before placing your order. If you have any problems working out a price, please contact the helpdesk and we'll sort it out for you. We can only print from an electronic original, please read the artwork preparation guide for help. ...and when is it a flyer? A flyer is just another name for a leaflet. Many people in the UK refer to a leaflet as a "flyer" when it's printed on stiff card. They're all leaflets! when's a leaflet not a leaflet? Certain characteristics will turn a leaflet into - for example - a form, a ticket or a poster. Why does this matter? If you are a VAT registered business, it doesn't matter one bit. If you aren't, then you should bear in mind that in the UK, leaflets are zero rated for VAT, provided that they meet HM Revenue & Customs leaflet definition. Confused? Have a read of the Help section "VAT, do I pay it?". All of the paper options offered on this page are manufactured from responsibly managed and sustainable sources. © 2006-2019 Inky Little Fingers Ltd. All Rights Reserved.